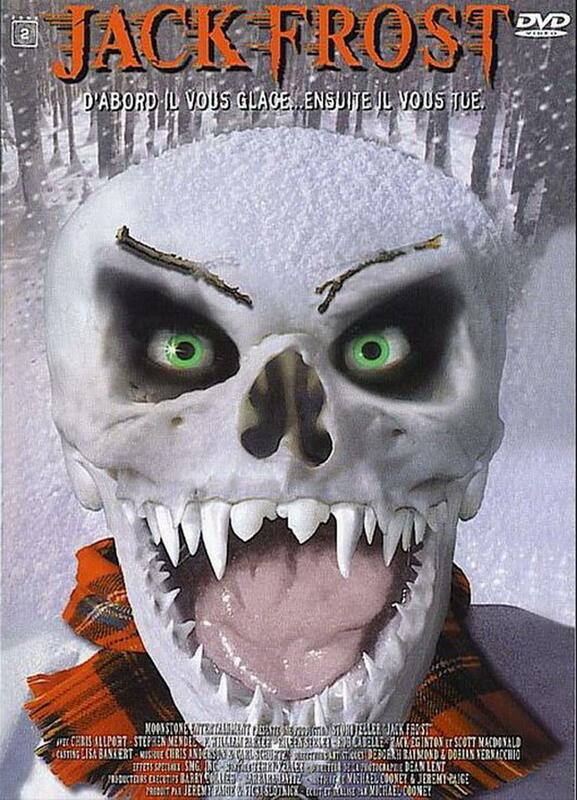 My experience with Jack Frost in the 90’s was limited to admiring the awesome lenticular VHS box art. Horror movies really went all out in the 90’s with awesome lenticular covers, and while they looked amazing on the video store shelf, that usually was a sign that the film was absolute garbage. 1. It was streaming on Amazon Prime. 2. It has Shannon Elizabeth in it. 3. Mainly because it was streaming on Amazon Prime. A freak accident genetically mutates a serial killer with a grudge into a snow man. -Jack Frost is obviously a low budget film with terrible special effects and acting. However, the cinematography is actually quite good and gives the film way more legitimacy than it deserves. -I loved the use of classic Christmas songs throughout the score. It was done tastefully and humorously at times. One scene that comes to mind particularly is Shannon Elizabeth’s (13 Ghosts) tease as she slowly unbuttons her shirt to the soft tones of The Twelve Days of Christmas. -There was no budget for the snow man special effects and for the most part they are portrayed by someone wearing a white snow man arm that looks like it’s made out of fleece. -I feel like the script started off as a legit horror film and once they realize they didn’t have a budget, they infused comedy into the script in order to shield themselves from any mockery to come. It’s easy to laugh it off and say, “Well it’s not meant to be taken serious” when the film is so absurd. -Scott MacDonald does the voice of Jack Frost and he seems to be channeling Brad Dourif’s Chucky voice, but a poor man’s version. It’s not good and his one liner’s don’t even come out well. -The lack of real snow or convincing fake snow hurts the film. They are supposed to be snowed in, but only small patches of snow are around. The fake snow they use for snowballs and the snowmen is so terrible it’s obviously not snow. Also, they started to spray the windows of the cars with that fake frost stuff you see around Christmas time, but as the movie went on they got lazier and lazier about spraying the cars down. -The film was shot in the winter of a drought year, so no real snow existed on the ground. Foam and cotton balls were used to simulate snow. -One of Shannon Elizabeth’s first acting gigs. -It was shot in just eighteen days. -To save money, the film was shot on short ends (left over pieces of film from other projects). -It was originally slated to be directed by Renny Harlin with a $30 million dollar budget. -Spawned one sequel: Jack Frost 2: Revenge of the Mutant Killer Snowman. Jack Frost was more watchable than I thought it would be. Don’t get wrong, it’s absurd and a bad movie, but it’s not so bad its unwatchable the way Lover’s Lane was. 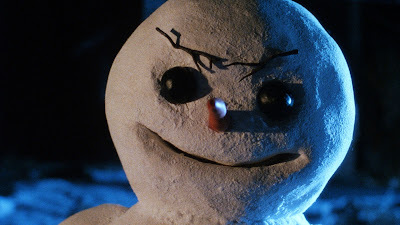 I have no interest in seeing the sequel, but I wouldn’t mind seeing a legit killer snowman movie created by someone who can handle the idea and is able to make practical effects work. I would rate Jack Frost a three out of ten and say it skip it, unless you love bad movies. When I first heard that a Krampus movie was coming out I was less than enthused. I had heard Kevin Smith discussing his version of a Krampus movie for at least a year before this Krampus film got made, and it just didn’t sound all that great. The plot from what I could tell was: an evil Santa comes down to punish the wicked. I’ve been on the lookout for the film since August, but hadn’t run across it at a great price until I found it at Walmart in a bin of leftover Black Friday DVDs. I picked up Krampus and watched it the following day and enjoyed it quite a bit, although not nearly as much as Trick ‘r Treat. A boy loses his holiday spirit and ends up releasing a demon upon his family and town. -The design of Krampus, the elves, and his assistants were fantastic. Each of them was unique and creepy in their own way. -I was initially worried about Adam Scott and David Koechner being cast because I didn’t think this film should be a horror-comedy. It isn’t, although it doesn’t take itself serious at all, and that allows for some over-the-top moments that do come off comical. I’m just glad the actors didn’t play it that way. -There is a scene done entirely in stop-motion that is so well done I wanted it to last longer. It made for a brilliant break in the story and gave the movie a special look. -I thought the final scene was brilliant and an excellent way to end the movie. -The film definitely pays homage to Christmas Vacation and that worked in making the film feel even more like a Christmas movie. -The film is definitely a horror movie, but it really lacks the tension and gore a quality horror movie needs. I would have love to have seen this film with an R rating. I think it would have gone down as one of the greatest. -Some of the CGI could have used a little more polish. -I didn’t buy Max’s remorse towards the end, especially his concern for his cousin. -Krampus is a real part of German/Austrian folklore. He comes to punish children that are bad. -The snow was made from the same material that is used to make diapers. -You can see Sam from Trick ‘r Treat’s lollipop in Max’s page of leftover Halloween candy. -Almost the entire movie was shot on a soundstage. 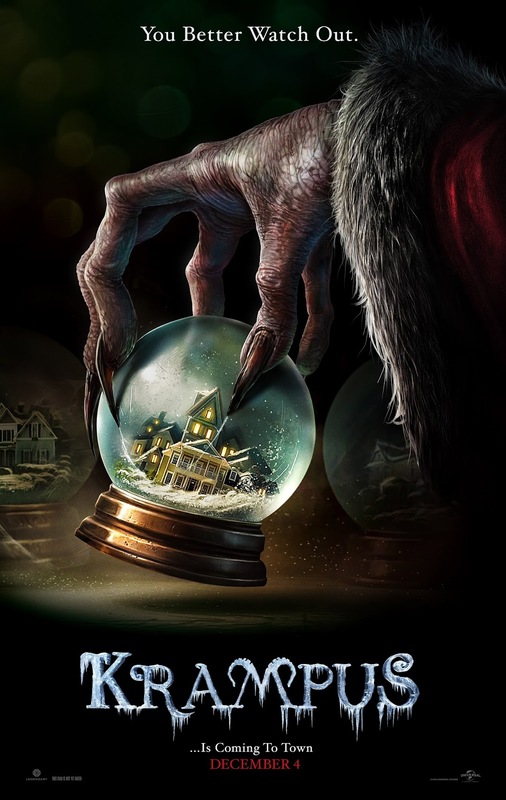 Krampus was an entertaining film that offers horror fans a new Christmas film to add to their collection. I thought the atmosphere, set, and character design were good, but ultimately the movie fails at channeling the same energy that made Trick ‘r Treat so great. It’s very worthy of a Christmas watch, but I do not see this film making it into my yearly holiday rotation. I’d say Krampus is a six out of ten and a rental. I honestly cannot remember the first time I saw Gremlins. It came out a year after I was born and was one of those movies I think all kids growing in the 80’s saw over-and-over again. Gizmo was the pet we all wanted and the movie offered enough horror and goo to really keep us coming back to watch the film. There is a huge debate on whether Gremlins is actually a horror movie or not. I feel like it’s a family movie with horror elements, as strange as that may sound. It has been several years since I last saw Gremlins and upon my most recent viewing right after Thanksgiving, I found myself a little astonished at how graphic the movie really was. I love that films were made in the 80’s without a specific audience in mind, it made for unique movies that don’t feel like they come from the same cookie-cutter factory that most movies come from nowadays. A teenage boy is given a unique pet that comes with a strict set of rules that when no obeyed causes the pet to turn into an aggressive monster. -The animatronics are great and Howie Mandell knocks it out of the park as Gizmo’s voice. -The movie just feels like the 80’s and it’s the perfect mixture of both Steven Spielberg and Joe Dante. -The music is iconic for a reason. It’s so well used throughout the film and really sticks with you after watching it. -As I mentioned earlier, I love that this film wasn’t sent through a dozen filters to make it the most palatable for all audiences. The film has no problem dipping into some really dark stuff and I’m not just referring to a Gremlin being cooked in a microwave. Kate’s monologue about her father’s death was horrifying. -It blew my mind when Gizmo first gets wet and is obviously screaming out in pain as the other Gremlin hatchlings are exploding from his back that neither Billy nor Pete seem to care one bit about Gizmo. It was arguably the most disturbing scene in the whole movie. -The ending was not the happy ending we all wanted, but it was probably the mature and responsible ending which was most realistic considering what happened. -The movie is about twenty minutes too long. The original cut was 2 hours and 40 minutes, which I could not imagine sitting through. -The set for Kingston Falls is the same one used in Back to the Future. -This film, along with Red Dawn, and Indiana Jones and the Temple of Doom are credited with help creating the PG-13 rating. Gremlins was rated PG, which many felt was too tame, but it wasn't hard enough for an R rating. -All of the Gremlins were animatronic and cost between $30,000 and $40,000 apiece. They were brought onto the set in trunks and guarded by security to make sure they weren’t stolen. -It was released the same day as Ghostbusters. 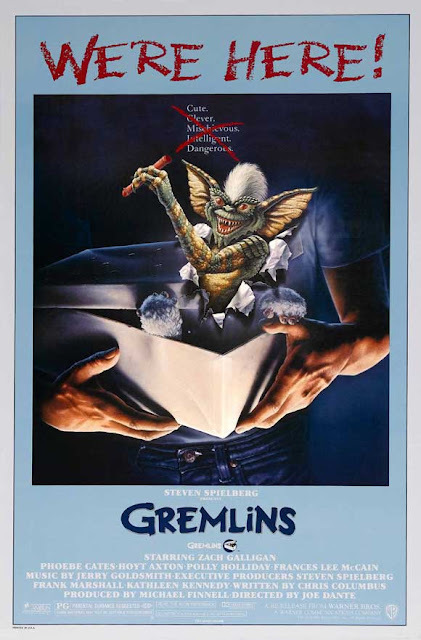 -Originally Stripe was going to be Gizmo as he turned into a Gremlin but Steven Spielberg felt that at least one Gremlin should remain good so that the audiences could relate. -The original script was much darker included several on-screen deaths including Billy’s mom. There was also a scene where the Gremlins were at McDonalds eating people instead of burgers. -It was the first movie in years to use the Warner Brother’s shield logo. The logo was restored for the movie and there was an attempt to include the Loony Tunes short “Falling Hare” where Bugs Bunny plays a Gremlin. The Loony Tunes deal didn’t work out but the shield logo was used. -Mushroom, who played Billy’s dog, was also Lance Henrikson’s dog in Pumpkinhead. Gremlins is a classic. It still looks great and is a fun movie to watch. It features some great voice work and fantastic animatronics, but it does run a little long and has some dry spots in it. I’m attempting to assemble a yearly Christmas watch list and was hoping to add Gremlins to it, but I just don’t see myself watching this film every single year. I think I’ve just seen it too many times in the past. Everyone should see Gremlins once, and while it isn’t a perfect movie, it’s a fun movie that is well worth your time. I rate it a seven out of ten and say it’s a high priority rental.